As mentioned on my previous article, it was our good friend, Michael, who introduced us the idea and opportunity of migrating to New Zealand. There are a number of ways to work and live in New Zealand, as to our case, we applied in the Skilled Migrant Category (SMC). We opted not to apply via agency as we knew that it would cost us more fees. All information are available in the New Zealand Immigration website www.immigration.govt.nz and joining in a community such as www.pinoykiwi.com to learn more about the application process. Important note: This process of application may not be exactly applicable to everyone. There are a few factors that are to be considered, like qualifications (if your school/institution is in the list of exempted for assessment) and work experiences (if your occupation is considered as a skilled occupation). More important note: These are base on our personal experiences and should not be taken as a legal immigration advice. Only licensed advisers are legally allowed by law to provide immigration advice. If you're looking for a licensed immigration adviser, you may visit Immigration Advisers Authority website http://www.iaa.govt.nz. Here’s a flowchart showing the procedures in applying under Skilled Migrant Category (SMC). We registered in the New Zealand Immigration website www.immigration.govt.nz, once you have your account created, you will be able to submit your EOI (Expression of Interest), make payment online, and view your application status throughout the process. Expression of Interest (EOI) is a form, approximately 47 pages, where you fill-in your personal details, qualifications, work experiences, etc. It will also calculate how much points you can get base on the details you provided. During our time (January 2016), the immigration requires 140 points for the applicant to be selected in the pool and we got 145 points. After the recent immigration changes (October 2016), they now require 160 points. The school/institution we graduated from is in the List of Qualifications Exempt from Assessment (Appendix 3 of https://www.immigration.govt.nz/opsmanual) so we proceeded with the EOI without undergoing pre-assessment. If your school/institution is not in the list, you will need to process first the pre-assessment by the New Zealand Qualification Authority (NZQA) to qualify the points you want to claim. You also need to check if you’re in a skilled occupation to claim points, refer to the List of Skilled Occupation (Appendix 6 of https://www.immigration.govt.nz/opsmanual) or through the Skill Shortage List Checker (http://skillshortages.immigration.govt.nz). After completion, we submitted our EOI and paid online. Ten days after we submitted our EOI, the application status online was updated from “EOI Submitted” to “EOI Selected. 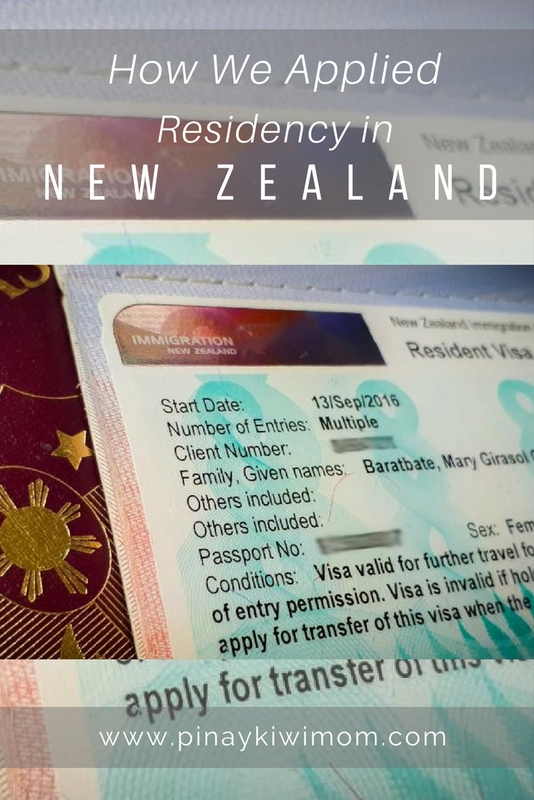 The next day, we received the Invitation to Apply (ITA) email from NZ Immigration. It has an attached checklist of documents we need to comply for the application and we were given 4 months to compile and submit the documents. Evidence of Partnership (if spouse is included in the application) - Documents such as marriage certificate, joint bank account, pictures, etc. Evidence of English Language Ability - At that time when we applied, IELTS was not really a requirement. We just submitted a certificate from our university stating that English is the medium of instruction for academic subjects. We also wrote a cover letter explaining our English language background with supporting documents. As we opted not to submit the original passports and diplomas, we enclosed their certified true copies only. It took us 75 days to complete the requirements and we sent the documents via DHL to Immigration New Zealand - Shanghai Office (China) with a bank draft as the application fee. When the immigration office received our documents (after 3 days), the application status was updated to “ITA Lodged” which means they have accepted it for processing. We also received an email confirmation from the immigration officer saying that they will be allocating our application to a case officer within 2 months. Case officers are the ones who will assess your application and contact you if there are additional documents needed. They are also assigned to conduct a phone interview to the applicants. It was after 32 days when we received an email from our case officer. She requested additional documents would support our past work experiences in Singapore and we submitted them after 3 days. The immigration will grant you a resident visa. The immigration will grant you a job search visa instead. The immigration will decline your application for visa. Though we knew that it would take months for the result to come out, we constantly check our emails and the immigration website for the application status. Exactly 26 days after our interview, the result came out and they granted us a residence visa. We also received the Approval In Principle (AIP) letter via email. It is a formal letter from the immigration stating that they have approved our visa and they gave us until 6 months to submit our passports to the same immigration office for visa stamping. We submitted our passports via DHL for visa stamping and after 13 days we were able to received them back already. From the date the visa was granted, you will have 1 year to make your first entry to New Zealand or else the visa will be forfeited. I could say that our application journey was a combination of luck and perseverance. We are in luck because a month after they approved our visa, the immigration announced a change in policy that would increase the points required in applying for residency. There are also a few policy changes since then so it is best to check the immigration website. The policy and requirements may have changed but the process is more or less the same.